Hi, best-selling financial author and trusted government currency adviser Jim Rickards here. If you haven’t heard, I’ve just released a new book called The New Case for Gold. The book warns of a few critical dangers that every American should begin preparing for right now. For the first time ever, I'm publicly revealing my #1 technique for surviving the coming dollar collapse. I personally have more than $1,000,000 of my own money invested in this financial technique, to protect myself and my family... and I strongly recommend that every American with exposure to the dollar devote at least a small amount to this too... BEGINNING IMMEDIATELY. In fact, I'm on a nationwide campaign to spread the book far and wide... for FREE. Because in a world full of financial and political lies, I believe every American deserves to know the truth. That’s why I’ve gone ahead and reserved a free copy of my new book in your name. It’s on hold, waiting for your response. I just need your permission (and a valid U.S. postal address) to drop it in the mail. Click here to fill out your address and contact info. If you accept the terms, the book will arrive at your doorstep in just a week or two. P.S. When you order your copy of The New Case for Gold I'll also throw in a few special bonuses that aren't available anywhere else. Click here for details. Coming up we’ll hear an amazing interview with James Rickards, author of Currency Wars, The Death of Money and now The New Case for Gold. Jim shares his incredible insights into the muddled minds of Fed governors, the ramifications of negative interest rates, and the likelihood of gold going through a significant repricing. Don’t miss an explosive interview with Jim Rickards coming up after this week’s market update. Gold and silver markets posted modest gains Thursday as strong gains in mining stocks point the way toward potentially brighter days ahead for bullion investors. The HUI gold stocks index broke out of its recent trading range to the upside, finishing Thursday at its highest close of the year. As a group, gold mining equities are now up better than 65% for the year! Gold stocks are running well ahead of gold spot prices so far in 2016. That bodes well for gold itself. Investors have aggressively bid up mining stocks in anticipation that they will return to profitability. In effect, gold stock investors are betting on rising precious metals prices, which is the major variable that drives miners’ earnings. Gold prices will need to break out above the $1,280 level to register new highs for the year. As of this Friday morning’s trading, gold comes in at $1,239 an ounce, up 1.3% on the week. Silver, meanwhile, looks higher by 1.7% this week to trade at $15.33. Silver prices will need to clear the $16.00 level in the days ahead in order to make fresh new 2016 highs. The silver market has lagged recently along with base metals. Copper prices are down more than 4% this week as traders eye a supply glut out of China. With copper production likely to get scaled back in the months ahead, it’s worth keeping in mind that 20% of all silver mined comes as a byproduct of copper mining. It’s yet another factor that could make silver more scarce. Turning to the platinum group metals, platinum is moving modestly higher, while palladium is acting as this week’s ugly duckling. Platinum prices currently come in at $970 an ounce, up 1.0% this week. The palladium market is looking at a weekly loss of 4.2% with the spot price now trading at $544. Metals markets seemed to be little affected by the Federal Reserve’s latest policy statement. On Wednesday, Fed officials released the minutes from their March meeting. They vowed a “cautious approach” toward hiking rates, with most Committee members seemingly opposed to making any policy changes at the Fed’s next meeting on April 26-27. Some of us would certainly like to see some fundamental changes to the way our nation’s monetary policy is handled. And some of the candidates now running for Congress and even the nation’s highest office are on board with auditing the Federal Reserve and instituting sound money reforms. Both Ted Cruz and Donald Trump have at times indicated their support for a gold standard. Here’s what Mr. Trump had to say recently regarding gold. Donald Trump: Bringing back the gold standard would be very hard to do, but boy would it be wonderful. We (would) have a standard on which to base our money. As a practical political matter, gold-backed money probably wouldn’t be the first item on Donald Trump’s agenda of things to try to ram through Congress. But at least he’s avowedly favorable to the idea of a gold standard. No President has been since Richard Nixon rescinded gold convertibility. With that, he basically handed over unlimited borrowing ability to Congress and unlimited money printing powers to the Federal Reserve. Of course, Donald Trump still faces a number of roadblocks to securing the GOP nomination, let alone winning the general election. He has neglected to build a strong organization to this point, hoping to carry the day based on his personality and will. But that’s put him in a weaker positon, particularly as it is now becoming more likely that he will not win a majority of delegates heading into the Republican convention. So now there could be one heck of a fight over delegates. To paper over their own organizational shortcomings, a worried Trump campaign is already accusing the Cruz campaign of trying to steal the nomination. And both Trump and Cruz backers have good reason to be concerned about the possibility of the GOP establishment moving to deny each of them the nomination. Party bosses could change the rules to give third place John Kasich a path to the nomination. Or they could drop in Mitt Romney or Paul Ryan out of nowhere at the convention, as former House Speaker John Boehner has suggested. Some establishment Republicans feel they are entitled to have a candidate who meets with their approval, regardless of whether the voters approve. In any event, the contentious and unconventional nature of the 2016 campaign has at least opened up the national discussion to some outside-the-box policy ideas, including gold-based money. Each of the candidates and their economic advisors would be wise to pick up a copy of the new book by Jim Rickards, called The New Case for Gold. And now, for some fantastic insights on the subject of gold straight from that author’s mouth, let’s get right to this week’s exclusive interview. Mike Gleason: It is my great privilege to be joined now by James Rickards. Mr. Rickards is Chief Global Strategist at the West Shore Funds, editor of Strategic Intelligence, a monthly newsletter, and Director of The James Rickards Project an inquiry into the complex dynamics of geopolitics and global capital. He's also the author of several best-selling books including The Death of Money and Currency Wars and just released his latest work, The New Case for Gold. James is a portfolio manager, lawyer and renowned economist having been interviewed by CNBC, the BBC, Bloomberg, Fox News and CNN just to name a few. And it's a real honor to have him on with us again. Jim, we really appreciate you taking the time to talk with us today, and welcome back. Jim Rickards: Thank you Mike. It's great to be with you. Mike Gleason: First off, I'd like you to talk about how you view gold because I think it's important to start with that before we get further into the discussion. I want people to understand where you're coming from. Now I know in the book, The New Case for Gold you go through some of the definitions and purposes of gold, but how should people view it? Jim Rickards: I actually few it as money Mike, and I'll expand on that a little bit. Although, how I view it is one thing, but how the world views it is another. In other words, you want to take into account different ways people look at gold and think about gold. If you're going to own it or going to store wealth in it, again I think it's a pure form of money, but not everyone agrees with that. It's important to understand how other people think about it. On that note, I call gold a chameleon. Sometimes gold trades like a commodity. Sometimes it trades like an investment, and sometimes it trades like money. It's like a chameleon. You put a chameleon on a green leaf, it turns green. You put it on a tree trunk, it turns brown. It adapts to its circumstances. Gold is often thought of as a commodity. It does trade on commodity exchanges, I understand that, and it tends to be included in commodity industries. The common understanding is gold is a commodity in commodity trade. I really don't think that's correct. The reason is that the definition of a commodity, it's a generic substance, it could be agricultural or a mineral or come from various sources, but it's sort of a generic undifferentiated substance that's input into something else. Copper is a commodity, we use it for pipes. Lumber is a commodity, we use it for construction. Iron ore is a commodity, we use it for making steel. Gold actually isn't good for anything except money. Gold is probably the best form of money, but it's not really good for anything else. People don't run around the world and dig up gold because they want to coat space helmets on astronauts or make ultra-thin wires. Gold is used for that, but that's a very small portion of the application. People point to jewelry and say, "There's a different application," but I think of jewelry as wearable wealth. No better example than an Indian bride for example where they might have four or five pounds of 18 karat gold necklaces around their necks, and it's very stunning and maybe attractive, but they consider it to be their wealth. So it's really just a wearable form of wealth. So I don't really differentiate between jewelry and bullion in terms of the monetary gold. So I don't think of gold as a commodity for that reason. It's not really input into any process or industrial process, but nevertheless we have to understand that it does sometimes trade like a commodity. As far as being an investment is concerned, that's the most common usage. People say, "Well, I'm investing in gold," or, "I'm putting part of my investment toward bullion gold." Again, I don't really think of gold as an investment. I understand that it's priced in dollars, and the dollar value can go up, and that will give you some return, but to me that's more a function of the dollar than it is a function of gold. In other words, if the dollar gets weaker, sure the dollar price of gold is going to go up or as has happened recently, if the dollar gets stronger, then the dollar price of gold may go down. So if you're privileging the dollar as the measure of all things, then it looks like gold is going up and down, but the way I think of it is I think of gold by weight. An ounce of gold is an ounce of gold. If I have an ounce of gold today, and I put it in a drawer, and I come back a year from now and take it out, I still have an ounce of gold. In other words it didn't go up or down. The dollar price may have changed, but to me that's the function of the dollar, not a function of gold. I don't really think of it as an investment. That goes to one of the point I make in my book. One of the criticisms of gold, and I don't think it is a criticism, it's just a fact is that gold has no yield. You hear it from Warren Buffet, you hear it from others, and that's true, but I kind of shrug and say, "Well yeah, but gold is not supposed to have a yield because it's money." Just reach into your wallet or your purse and pull out a dollar bill and hold it up in front of you, and ask yourself what's the yield? Well there is no yield. The dollar bill doesn't have any yield. It's just a dollar bill, the way a gold coin is a gold coin. If you want yield, you have to take some risks. You can put the money, put that dollar in the bank, and the bank might pay you a quarter of 1% or something, not very much, but now it's not money anymore. People think of their money in a bank deposit as money, but it really isn't money. It's an unsecured liability of an occasionally insolvent financial institution. The risk may be low, I'm not saying the risk is high or you ought to pull all your money out of the bank, but I am saying that there's some risk, and that's why you get a return. Of course, you can take more risk in the stock market or the bonds market and get higher returns. The point is, to get a return you have to take risk. Gold doesn't have any risk. It's just gold, and it doesn't have any return. It's not supposed to. I don't really think of it as an investment. So that brings me to the third part of the chameleon characteristic, which is money. And that's what gold is. Gold is money. It has no risk. It has no yield. It is the store of wealth. Classic definition, medium of exchange, unit of account. And that's important. So the way I think of gold right now, I think of it as money. I think it's in competition with the dollar, the euro, the yen, the Swiss franc, and other forms of money, bitcoin for that matter, they're all forms of money. And they're competing for the subjective preference of people who need money and want to store wealth and I think gold's doing very well in that context. Mike Gleason: The idea of a gold standard is getting more and more play these days, and has even been talked about some during the election cycle as certain candidates are calling for a return of the gold standard as a way to reign in all of the out of control government spending, but obviously many out there are very against this idea. And the example by the gold standard naysayers is what happened during the Great Depression. Now former Federal Reserve Chairman, Ben Bernanke famously complained that the Fed was hamstrung by the gold standard during the Great Depression. Talk about this because this is a common belief among Keynesian scholars and economists. Is that a correct assumption to say that the Great Depression either happened or continued as long as it did because the Central Bank had their hands tied by the gold standard? Are we dealing with fact or fiction there with this popular notion? Jim Rickards: Truly fiction. It's a combination of outright fiction. Some people who should know better who have their own reasons for disparaging the role of gold, and other people who don't know better they've just heard this repeated so many times that they believe it to be true without ever really studying it. Now the thing that did contribute to the Great Depression was the fact that the UK, prior to 1914 there had been a very successful gold standard from a global standard and a national gold standard from about 1870 to 1914 with different countries joining along the way. That was disrupted by World War I. After World War I in the mid-1920s, countries were looking for a way to go back to the gold standard, but they made a couple mistakes. Instead of going with a pure gold standard, they went with what was called the gold exchange standard. They said international standards can be gold, but it can also be dollars, pounds sterling, or French francs at the time. This obviously was a mix or a hybrid system in which gold played a role, but so did the currencies, which meant that the system as a whole is subjected to blunders and abuses by discretionary monetary policies. So when I look at the Great Depression, the causes of the Great Depression, it had very little to do with gold and everything to do with really poor discretionary monetary policy, particularly by the Federal Reserve Bank of New York, which eased in the late '20s when it should've tightened, and then tightened in 1929 and 1930 when it should've eased. So kind of like the Fed today getting everything wrong along the way. Now, going specifically to the point, there were two mistakes. One was in 1925 when the UK went back to gold, they went back at the wrong price. I say they, this was Winston Churchill, Chancellor of the Exchequer at the time, picked the pre-1914 price, which was $20 an ounce. Obviously, they expressed it in pounds sterling, but the dollar equivalent was about $20 an ounce. The problem was the UK had doubled the money supply to fight World War I. They printed money to fight World War I, that's what countries do. Actually, it was John Maynard Keynes who advised Churchill, Keynes did not really favor gold standard, but he said if you're going to go to a gold standard, you have to get the price right. Keynes favored a much higher price. He said, "If you go back to the gold standard at the old lower price, you're going to have to reduce the money supply to maintain the parody." That is contractionary and depressionary, and that blunder did contribute to the Great Depression. Gold didn't cause the Great Depression, but getting the price of gold wrong did contribute to the Great Depression. That wasn't a problem with gold. That was a problem with the politically determined price, and again, what is really discretionary monetary policy rather than gold per say. And Keynes was right, you should've had a much higher price. A gold price of $40 an ounce instead of $20 an ounce in 1925 might have avoided the Great Depression completely. We'll never know, but that could make a very plausible case for that. Now as far as the gold standard inhibiting or hindering the ability of the Federal Reserve to fight the Great Depression, that is completely false, and the source on that is none other than Ben Bernanke. And I spoke to Ben Bernanke about this personally. Before he became Chairman of the Fed or even the Board of Governors for the Fed, he made his academic reputation mostly at Princeton University doing research on the Great Depression, following in the footsteps of Milton Freedman and Anna Schwartz and some others who were the great pioneers of studying the Depression through the lens of monetary economics. Bernanke wrote a book on it, which I read when I was researching my book The Death of Money and the book before that Currency Wars. And what he revealed is at the time, the law allowed the money supply to be two and a half times the amount of gold. So take the amount of gold that the Fed had, priced in dollars, what was that, multiply the ounces by $20 an ounce, take that number, multiply is by 2.5, and that was the upper limit on the money supply. So the money supply could not legally be greater than that. Well in fact, the money supply during the Great Depression was never more than one times the gold. In other words, it had 100% ratio. It could've been 250%, which means that gold was never a constraint on the money supply. The Fed could have doubled the money supply in the early 1930s without having to worry about gold. So you can't blame for the continuation of the Great Depression. You have to blame the money supply. In fact, the real problem was that banks didn't want to lend, and people didn't want to borrow. This, by the way, is the same problem we have today. Banks don't want to lend, people don't want to borrow. Velocity's increasing, and you can't seem to get the inflation the Fed wants, and you can't seem to get the economy moving. That was exactly the situation in 1930. And that's what Bernanke showed in his book. So I met him recently, and had a very nice conversation with him. I said, "Mr. Chairman, I've read your book to say that gold was not a constraint on the money supply during the Great Depression. Do I understand that correctly?" He looked at me and said, "Yes, you do." So in other words, here's Bernanke confirming to me face-to-face that gold did not constrain the money supply of the United States during the Great Depression. So anyone who says that is true has their facts wrong. Anyone who says that gold caused the Great Depression has his facts wrong because as I say, it was political decisions and discretionary monetary policy, not gold that caused the Great Depression. Mike Gleason: Last time we had you on, you talked about the Fed and the fact that officials there have privately admitted they really don't know what they're doing, monetary policies essentially being run as a great big science experiment. They implement unprecedented policies and wait to find out what the results will be. For example, central bankers in Japan and Europe are today experimenting with negative interest rates. Common sense tells us that making people pay interest has to have dire consequences in terms of punishing those savers or protecting capital. Is it just extraordinarily short-term thinking that inspired such a bizarre policy, and do you see a reasonable chance of these monetary experiments yielding good results? Jim Rickards:I don't think it's a question short-term versus long-term perspective. I think the problem is that all of these experiments the Central Bank is conducting are based on models, and the models are flawed. The models are not a good representation of reality. They're actually either obsolete or just wrong in the sense that they don't offer a good description of reality. Your reference to negative interest rates is a good example of that. Let me explain the model, and let me explain the real world, and you can see that the real world is very different than the model, and you're going to get some very bad unintended consequences. So the model says the following, "If people are rational economic actors, they form expectations, and they'll behave today based on their expectations about the future." The banking authorities impose negative interest rates, which means in simple terms, if you put $1,000 in the bank and you come back a year later, you're only going to have $990 in the bank. They're going to take 1% or $10 as a negative interest rate. So they're going to take your money away. Now the theory is that you don't want that to happen. You're a rational actor, you're like, "Huh. If I just let my money sit there, they're going to take it away in a negative rate. I'll go out and spend it. I'll get something I want. I would rather spend it than sit there and watch it disappear”, like watching an ice cube melt in your hand, eventually the ice cube's going to be gone. It's sort of an incentive to get people to spend money, which in theory increases aggregate demand, increases monetary velocity, gets nominal GDP increasing, it helps to solve some of the debt and growth problems that we face today. So that's the theory. In the real world the opposite happens. What people actually say to themselves is, "You know what? I'm saving for my retirement. I'm saving for my kids college," or whatever it might be, "if you're going to have a negative interest rate, if you're going to take the money away, I'd better save more. I'd better increase my savings to make up for the negative interest rates so I can meet my savings and investment goals long-term," number one. Number two, what kind of message are you sending? What is the Central Bank saying when they impose negative interest rates? What they're saying is you're worried about deflation. So as a consumer, I say, "If you're worried about deflation, I'm going to spend less. I'm going to wait until the prices come down. Maybe I want to buy a car or a refrigerator or something, but if I think deflation's coming and prices are going to go down and I wait six months I can get it cheaper." So the theory of negative interest rates is that it encourages spending and increases aggregate demand, but the reality is that is actually increases savings and reduces spending and reduces aggregate demand. So it's a policy experiment. It has the opposite effect of what's intended, not because these people are stupid, but because they have bad models. That's just one example, there are may I could give you, but suffice to say the people with the least sophisticated understanding of how economies work are the people who are in charge of the economy, namely the central bankers and in particular the Federal Reserve. Mike Gleason: You talk a lot about currency wars and have written a book on the subject as we talked about last time we had you on. At some point, it will be in some major players interest for gold to be repriced much higher than it is today, and presumably they will have amassed a large inventory of physical gold by that point. Do you envision China or Russia, for instance, making any kind of gold related power-play at some point? What would motivate a major player to break ranks and essentially force a global repricing of gold? And what impact would such a scenario have? Jim Rickards:I think something like that will happen, but I don't believe it will come about because of some unilateral power-play on the part of China and Russia. Look, China and Russia are acquiring thousands of tons of gold. It's very clear. We don't have to guess. The Central Bank of Russia is fairly transparent. The People's Bank of China is much less transparent, but we have good information from mining output and Hong Kong exports into China, and the split between retail and government demand to form a reasonable estimate of how much China's getting, probably they have 4,000 tons, perhaps more versus about 1,700 tons that they admit to. So they have a lot more gold than they admit. Now the reason China's doing it is not to launch a gold backed yaun, a global reserve currency around the dollar, I'm not saying that those things absolutely could not happen, but that's not their short run play. The Chinese know that the yuan is not really ready to perform a true reserve currency function, but what they are doing is hedging their position in U.S. Treasury Securities. Right now, China's reserves are about $3.2 trillion, by the way, that down significantly, they were as recently as 15 months ago, they were $4 trillion. So the reserve position is down 20% or $800 billion in the last 15 months, and that's continuing. So they’ve got a serious problem with capital to begin with, but leaving that aside, they still have $3.2 trillion in reserves, of which about $2 trillion is denominated in U.S. dollars, and most of that are U.S. Treasury Securities. So they have a huge pile of U.S. Treasury Securities. They can't dump them. People talk about it, but the truth is the treasury market is deep and liquid, but it's not that deep and it's not that liquid. And there's no way the market could absorb any significant amount of selling by the Chinese. And if it became disorderly or disruptive or even viewed as malicious, the President could stop it, the President of the United States could stop it since the United States controls the payment system for U.S. dollars, and the ability of the Chinese to sell and settle those U.S. Treasury obligations. So China's not going to sell the Treasury Securities. They're stuck with them, but they fear that the U.S. will inflate its way out of the U.S. debt problem, and they're probably right about that. Historically, that's always been one of the ways the U.S. got out from under debt is by inflating the currency. So they're sitting there, hoping for a strong dollar. Believe it or not, the Chinese want a strong dollar because if you had $2 trillion of government securities, you'd want a strong dollar too. But they fear that the U.S. will try to inflate the dollar, which is reasonable to believe that because the Fed has said, probably many times that they have a 2% inflation goal, which they've come nowhere close to meeting, so the Fed is trying everything it can desperately to get some inflation. So what the Chinese are doing instead, they can't dump the treasuries, but the worried about inflation destroying the value of the treasuries, so they're acquiring gold as a hedge. So they've got to think of it as a big pile of treasuries and a big pile of gold. If the dollar's strong and treasuries maintain their value, the gold may not do very much. But if the U.S. gets the inflation it wants and the value of the treasuries goes down, which is the more likely scenario, the value of the gold is going to go up. China is going to be in this position where they lose on the paper, but they make it up on the gold. My advice to investors, and what I say to myself is, "You know what? If it's good enough for the Chinese, it's good enough for me." If they can see this coming, why can't everyday Americans see it coming. That's why I recommend the 10% gold allocation. I talk about that in my book The New Case for Gold. Mike Gleason: You've written about some significant supply constraints that are developing in the gold market. Talk about this because this is a dynamic that could, itself, blow the lid off of metals prices. What is your take on the global supply situation because we're seeing an awful lot of gold going from the west to those very strong hands over there in the east, as we just spoke about. And now, new production is on the decline. What do your findings show with respect to the global supply situation? 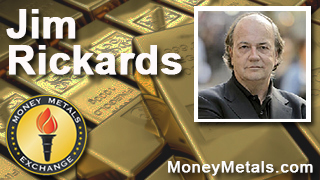 Jim Rickards: Well when gold goes from west to east, as people say, it stops in Switzerland. Recently, I was in Switzerland and I met with the head of the world's largest gold refinery. Here's a guy, and what the gold refineries do, they take gold in the front door, and they ship it out the back door, and in the middle they reprocess it. The gold that they get comes from three sources. There’s what’s called dore, which comes from the miners, that's about 80% gold. They get what's called scrap, which is jewelry: rings, watches, necklaces, et cetera. It could be about 75-90% gold depending on whether its 14 karat or 18 karat and so forth, maybe 75% gold. And they get gold bars, bullion bars and coins, which are 99% pure gold. Even that's not good enough because 99% gold is called 2-9s, 9-9. What the Chinese want is called 4-9s, 99.99% pure gold. So the refinery takes in the dore, the scrap and the 2-9s. They melt it down and turn it into one kilo bars of 4-9s, and they ship most of that to China. So this guy, my friend who runs the refinery, he knows who all the sellers are, and he knows who all the buyers are. He knows who the sellers are because that's how he sources his gold, and he knows who the buyers are because they're his customers. What he told me is that he's got a waiting list of buyers, that China wants to buy twice as much gold as he's going to sell them. He sells to them about 10 tons a week. China would like to buy 20 tons, but he can't supply it because he doesn't have that much gold. His plant is working 24 hours a day. On his buying side, his sourcing, he's saying, and he's been in the business for 35 years. He's saying for the first time, he's seeing physical shortages pop up. It's actually difficult to get the gold that he needs to keep his refinery operating and to meet the demand. So again, here's a guy who's right in the middle of the trade. Gold is coming out of the UK, London, the U.S., and elsewhere, the IMF, and it's going to China. It is going from west to east, but it's stopping in Switzerland along the way. He's the guy who turns it into 4-9s gold, which is what the Chinese want, and he's telling me that there are physical shortages out there. So it won't be too much longer before there's a failure to deliver by some dealer or some warehouse gets overwhelmed or the COMEX has to suspend trading because there's not enough gold in the vault to satisfy the demand by the longs. Something's going to break and make the price of gold skyrocket, and we are getting closer to that point. Mike Gleason: Obviously, the metals markets appear to be quite manipulated, but as we begin to close here Jim, what do you have to say to the guy who has been buying for the last few years, but hasn't seen the price go anywhere aside from maybe the first couple of months of this year maybe? Can the manipulation go on forever, and can they suppress prices and perpetuity or does it have an exhaustion point? 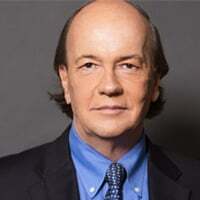 Jim Rickards:It has an exhaustion point, and the reason we know that is we've seen three price suppression mechanisms fail in the past 90 years. Go back to the 1920s, 1930s that the gold exchange standard that we talked about earlier where they set the price of gold artificially low, that failed because people said, "Well I'll just take the gold," and they couldn't maintain the pegs, and they were losing gold. One by one they had the devalue their currencies. France in 1925. England in 1931. The United States in 1933. France and England again in 1936 under the Tripartite Agreement. So that ultimately broke down, and the entire international monetary system broke down in 1939 with the beginning of World War II. And then there was the infamous London Gold Pool of the late 1960s where the G7 countries plus Switzerland banded together and agreed to buy gold to maintain the price, and sell gold as needed to suppress the price. A very simple price manipulation system, and that broke down. And in August 15, 1971, President Nixon ended the conversion of dollars into gold by the U.S. trading partners. Of course, we all know what happened next. We had hyperinflation, and the price of gold went to $800 an ounce. Then in 1971 it was $35 an ounce, by 1980 it was $800 an ounce. A 25 times increase, a 205% increase in a fairly short period of time. Then there was another gold suppression which has been going on since the end of Bretton Woods, even though Bretton Woods was over, the United States sold 1,000 tons of gold in the late 1970s and forced the IMF to sell 700 tons of gold. So there was 1,700 tons of gold dumped on the market in the late 1970s by the U.S. and the IMF. That ultimately failed, and of course like I say, the price skyrocketed in 1980. Thereafter, we stabilized the dollar with monetary policies, we didn't even try to go back on the gold standard, but we stopped selling gold, but the price suppression continued. The reason we stopped selling gold, by the way, is described in Chapter 1 of my book The New Case for Gold it's a very interesting story because it talks about the secret goal of gold on the Federal Reserve balance sheets. I hope the readers enjoy that, but there's a reason the U.S. cannot sell anymore gold, and it does have to do with propping up the Fed, but we got everybody else to sell gold. We got the UK to sell most of their gold in 1999. We got Switzerland to sell several thousand tons of gold in the early 2000s. We got the IMF to sell 400 tons of gold in 2010. Poor Canada, just this year revealed that they are the first major developed economy to have no gold at all. So even the poor Canadians had to dump 2,000 tons. The U.S. stopped selling our own gold, we went around the world and got everyone else to sell their gold, they did sell, and now they're running out. Meanwhile, China's buying more and more and more. So we are getting to the exhaustion point. These manipulations can continue for a while. It’s just a question of supply and demand. If people are willing to dump gold, and there's not that much demand, sure that'll drive the price down. But here you have a situation where people have stopped dumping gold for their own reasons, but the demand continues, and that's going to force the price to go up. Mike Gleason: Well Jim it's been a tremendous honor to speak with you today. We're huge fans of yours and have been for a long time. I want to tell our listeners that we've lined up a way for them to get a copy of your latest book The New Case for Gold along with a subscription to the Strategic Intelligence newsletter, our listeners need only look at the offer that is included in today's podcast announcement email or embedded into the podcast playback page on the Money Metals website. There is so much fresh information in this book. I thoroughly enjoyed digging into it in preparation for this interview, and I strongly encourage out Money Metals customers and listeners to either get the hard copy, download the audio book, or get a copy of it for your iPad or Kindle. It's truly great stuff, and we wish and your new book every success, and I really appreciate your time today. Thanks so much Jim. Jim Rickards: Thank you Michael. Mike Gleason: Well that will do it for this week. Thanks again to Jim Rickards, author of Currency Wars, The Death of Money, and now The New Case for Gold and also editor of the Jim Rickards’ Strategic Intelligence newsletter.